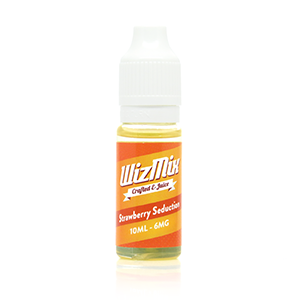 Wizmix Strawberry Seduction is a fantastically fruity flavoured e liquid which cleverly captures all the ambrosial juiciness of fresh strawberries. So named because the strawberry flavour is so good it will tantalise your taste-buds and tempt you into sticking with this Strawberry Seduction e-juice. From the bright, heady smell, right through to the pungent aftertaste, this juice is all strawberry goodness. It starts deceptively mild, sweet and fruity but quickly builds into a veritable explosion of full-bodied strawberry flavour, good and potent. The sweetness is kept under control, and complemented by a piquant tartness. The combination is beautifully balanced, and captures the essence of the whole fruit. It tastes for all the world like a fresh strawberry smoothie.